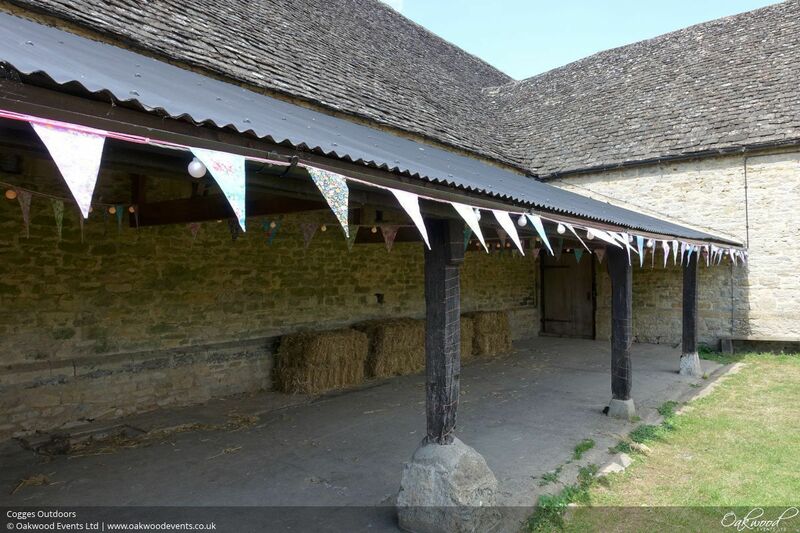 The barns at Cogges Manor Farm in Witney, Oxfordshire are a wonderful, secluded blank canvas venue for a wedding. Having two barns gives the flexibility to dedicate each to a different purpose so that guests can move seamlessly between them during the day. The larger of the two, the Wheat Barn, is the ideal location for the dining area and perhaps a dance floor at one end while the smaller Barley Barn is great as a bar with a chill-out area or dance floor. 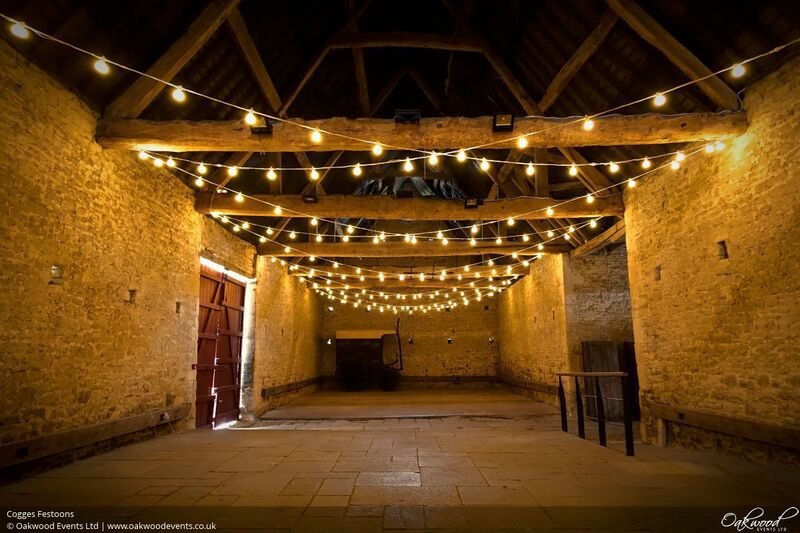 The layout of both barns is perfect for many different lighting designs. 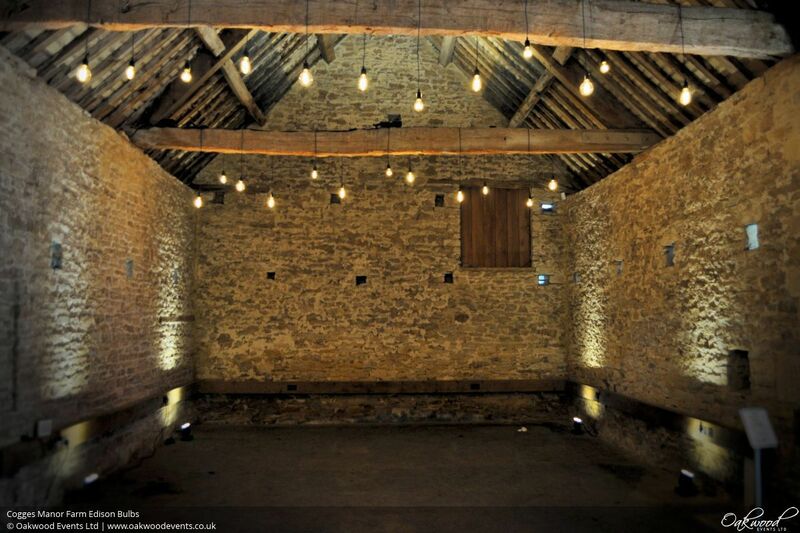 Listed below are some of the lighting options that suit Cogges particularly well. 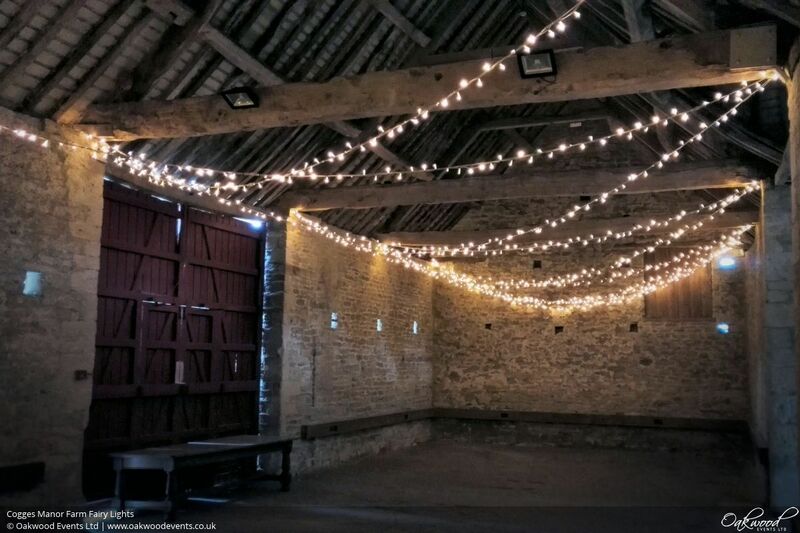 A large canopy of sparkly fairy lights looks absolutely beautiful in the barns at Cogges. 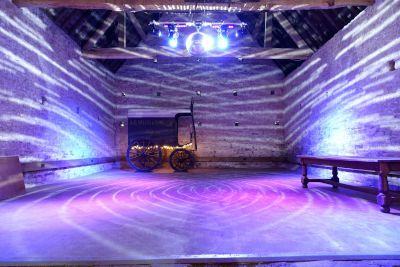 Our lights are warm white and dimmable so they light up the barn during the day and can be turned down to a soft glow for the evening. 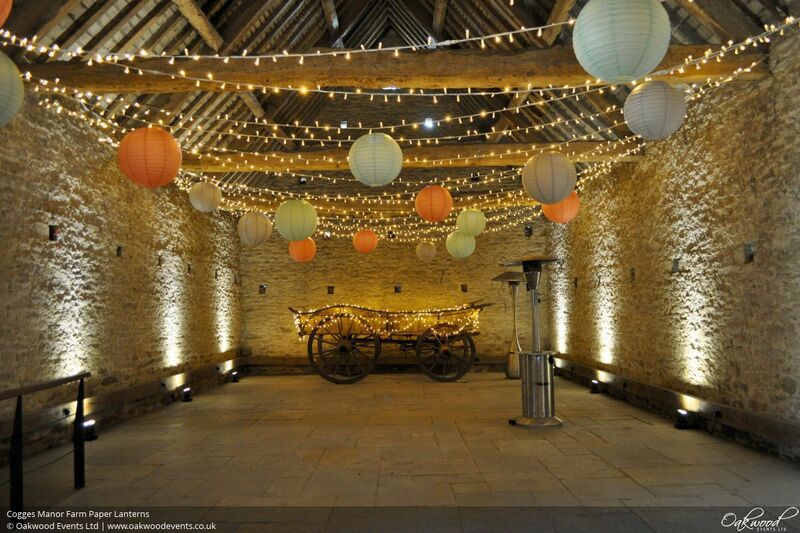 We offer lots of different fairy light canopy desings - see the fairy lights page for more details. 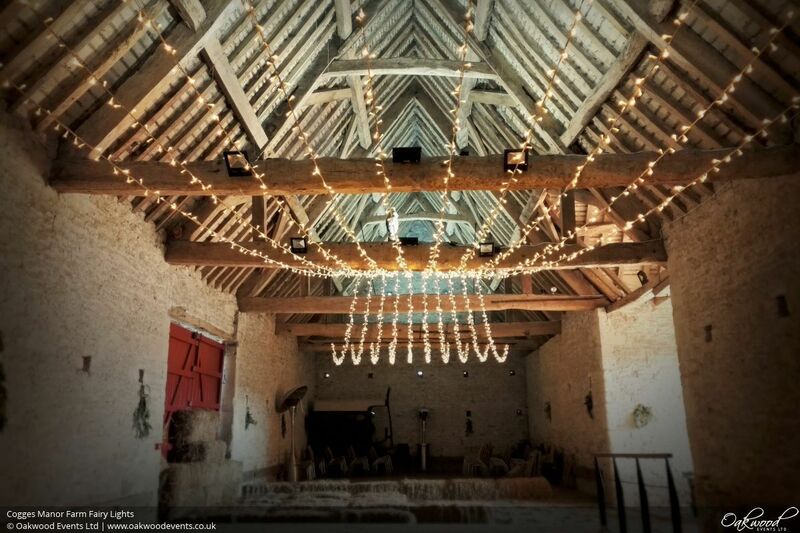 Festoons are a perfect style match for the rustic nature of the barns and look gorgeous draped from beam to beam. 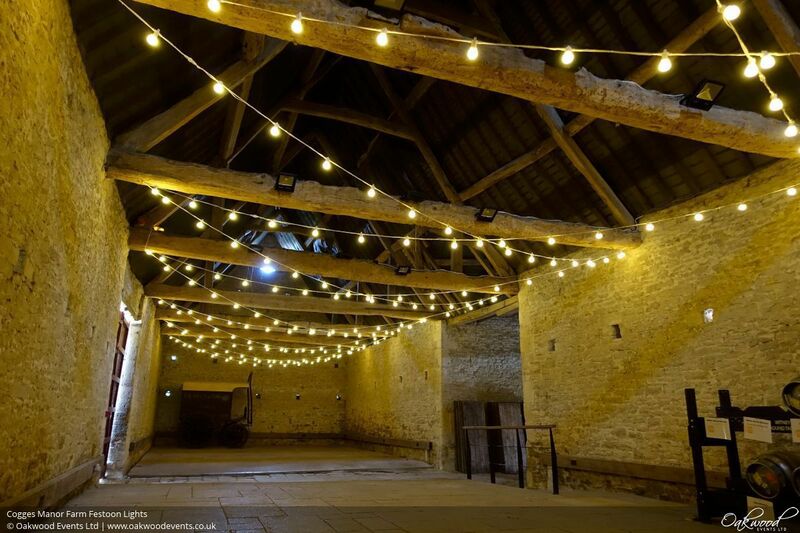 As with all of our canopies, our festoons are dimmable so that they can be bright in the day and dimmed for the dancing later on. 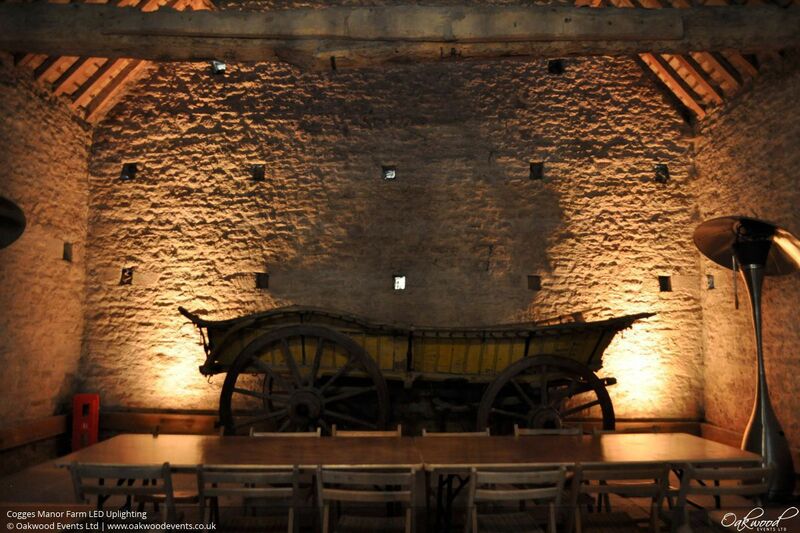 Uplighting fills in the light around the edges of the room, helping to create a cosy, intimiate atmosphere. 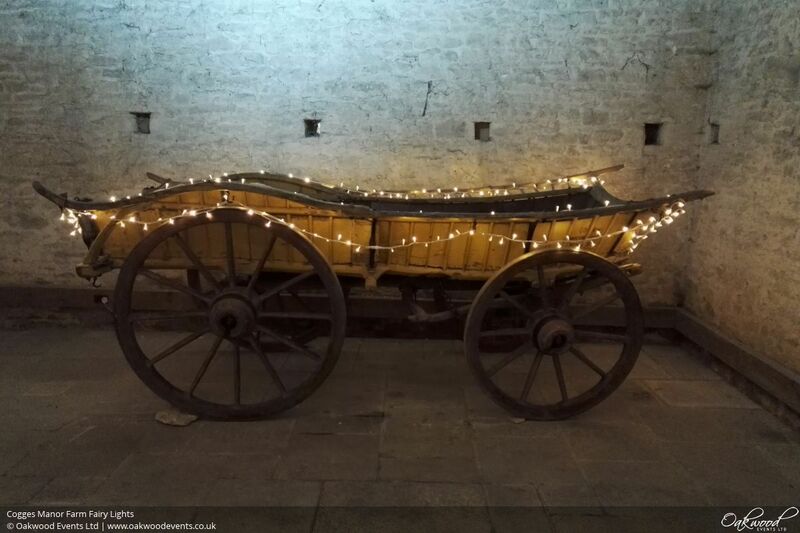 Our uplighters are supplied with an easy to use controller that lets you change the colour and brightness throughout the day. 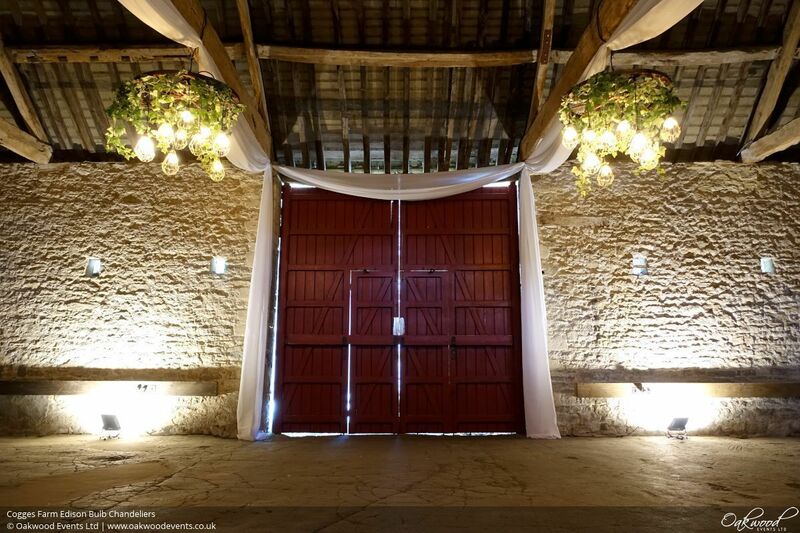 Uplighting is the ideal way to transform the mood of the barns from day to night. 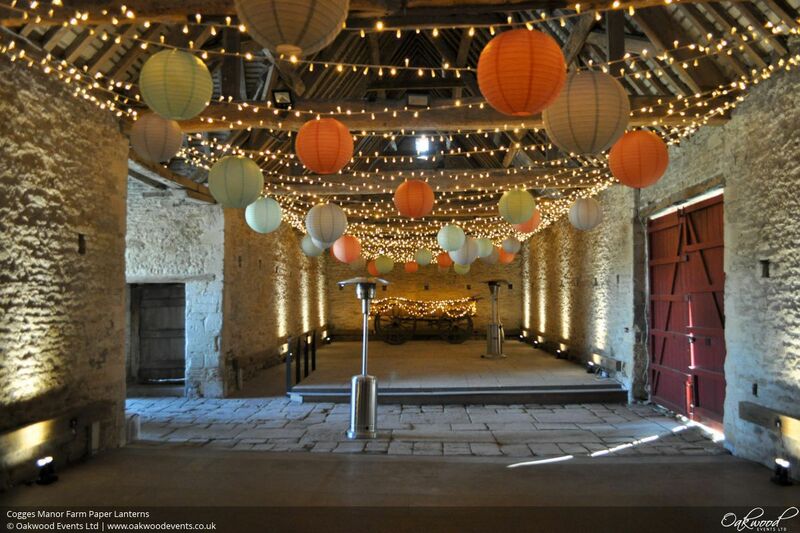 A fantastic way of personalising the barns with colour, a stunning canopy of paper lanterns can be hung overhead. 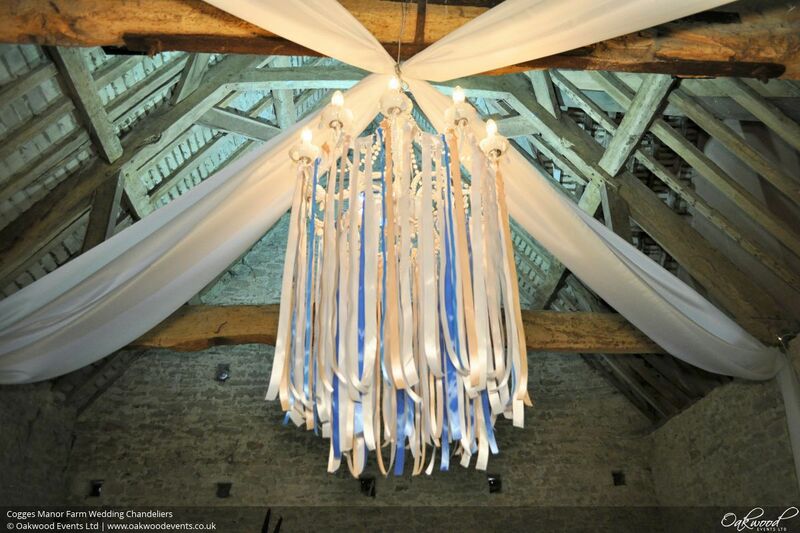 We have lanterns available in a large range of colours and custom wiring looms to light them. 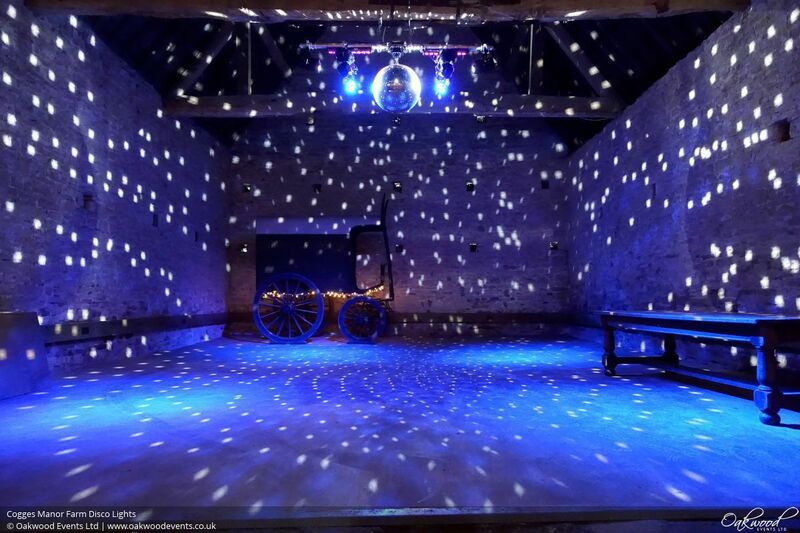 As an optional extra, our lanterns can be made to change colour in the evening for a full-room disco effect! 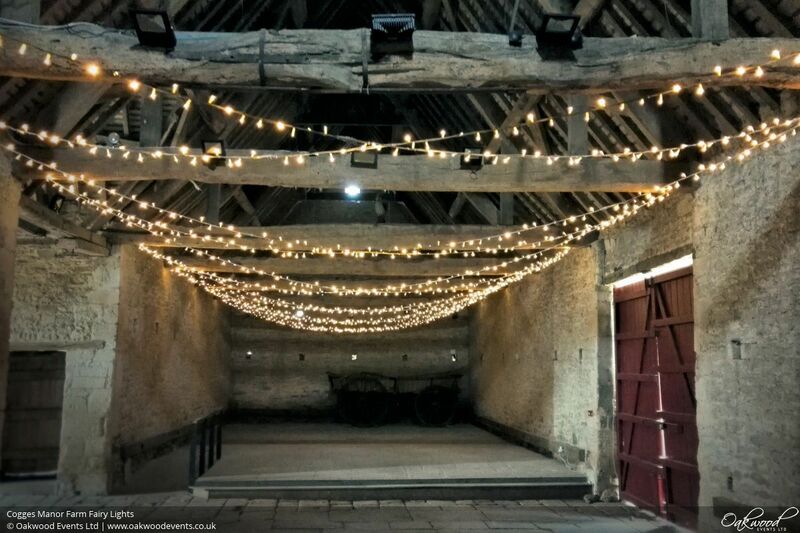 A set of chandeliers suspended from the beams fills the barn with soft, flattering light and adds a real touch of glamour. 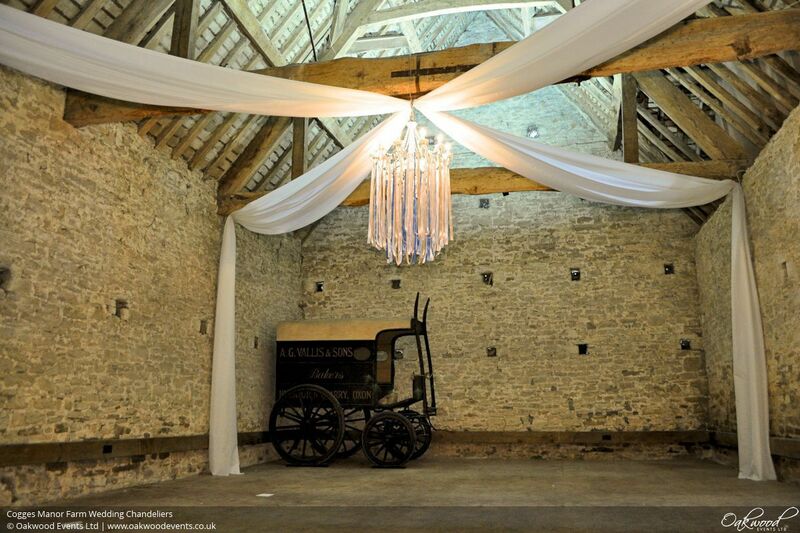 We have several styles of chandelier available including crystal, vintage and tiered - see our main chandelier page for more details. 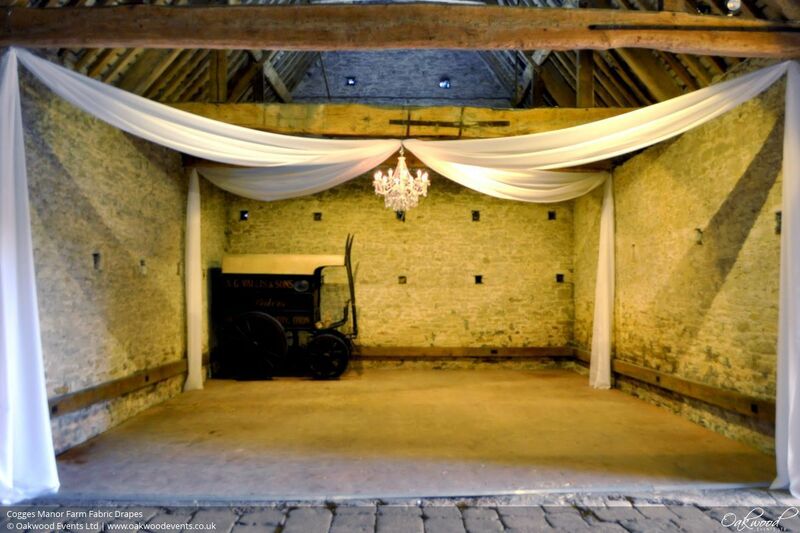 Silky, flowing fabric drapes to soften the lines of the barn and give it a really cosy feel. Drapes work well at Cogges installed either as a series of up-and-over shapes under each beam (perhaps combined with chandeliers), or in a cross formation with a central feature. 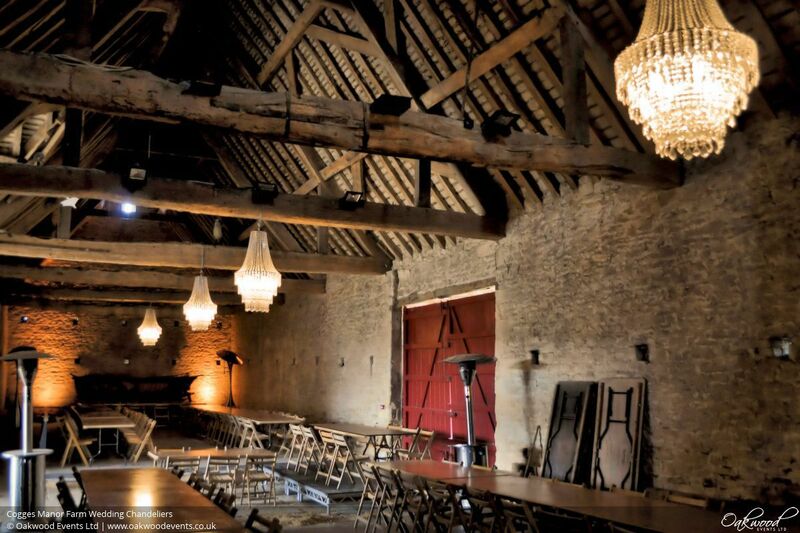 Mixed sizes and shapes of Edison bulbs hanging at varying heights from the beams are great for creating a chic look in the smaller Barley barn to differentiate it as a bar area or dance floor. 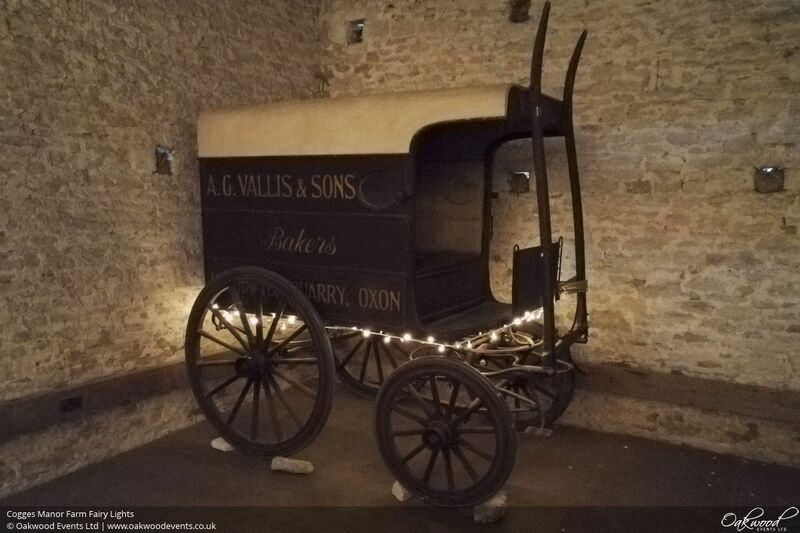 The bulbs are fully dimmable for the evening and look great combined with uplighters around the walls, as shown here. 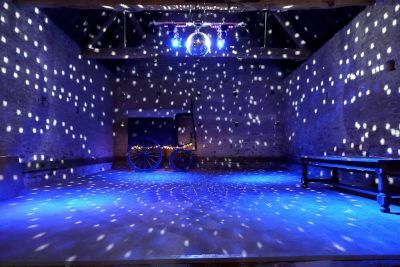 A set of high quality disco lights mounted above the dance floor, projecting colour and movement over you and your guests as you dance the night away! We have a wide range of effects available including colour washes, moving heads, mirror balls, UV, etc. 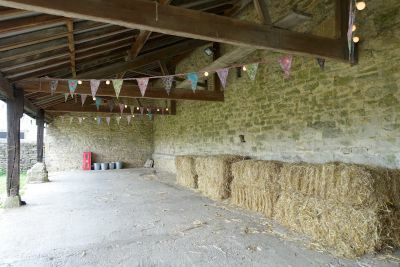 to really get the party started. We can also supply a powerful PA system for a complete DIY disco. 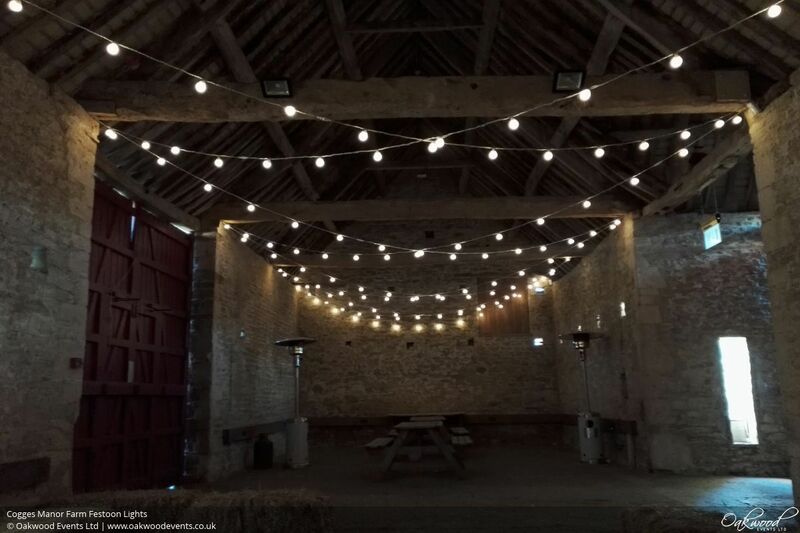 Make use of the covered outdoor area into the evening by adding some fairy or festoon lights zig-zagged through the roof space. 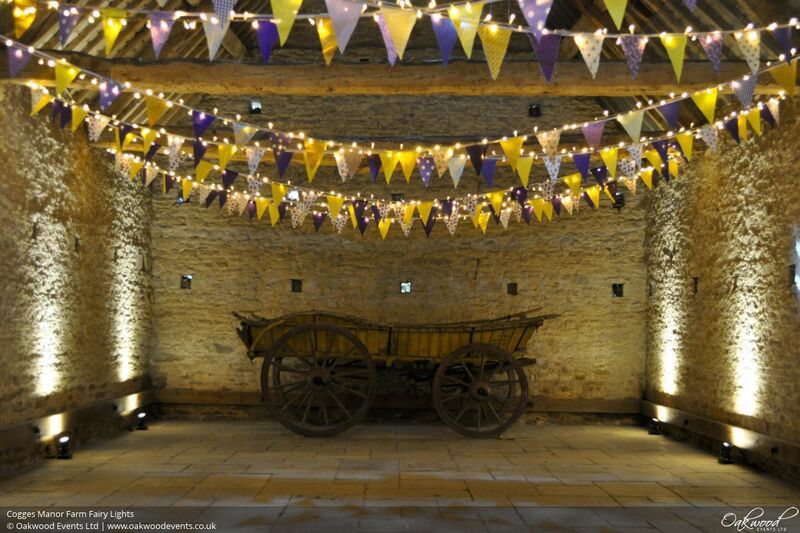 Add a touch of colour or a vintage style with our bunting. 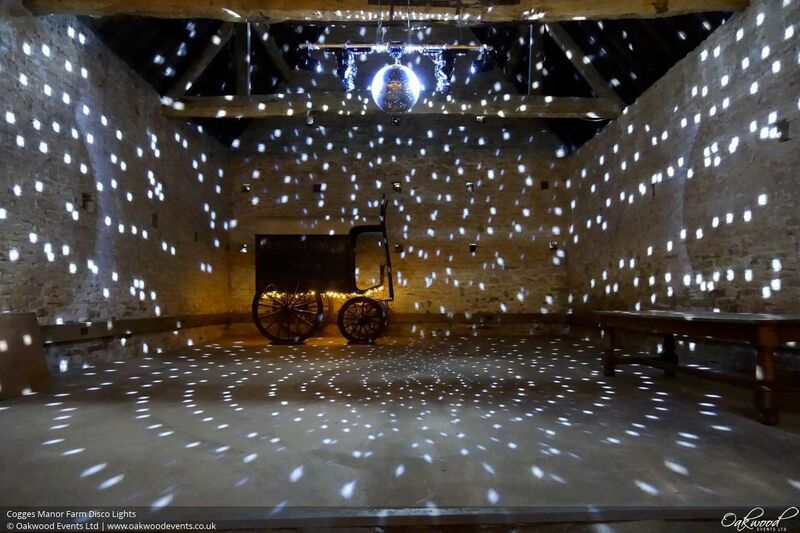 We're well practiced installing lighting in barns so we're able to install large scale displays quickly and efficiently while causing the minimum disruption. 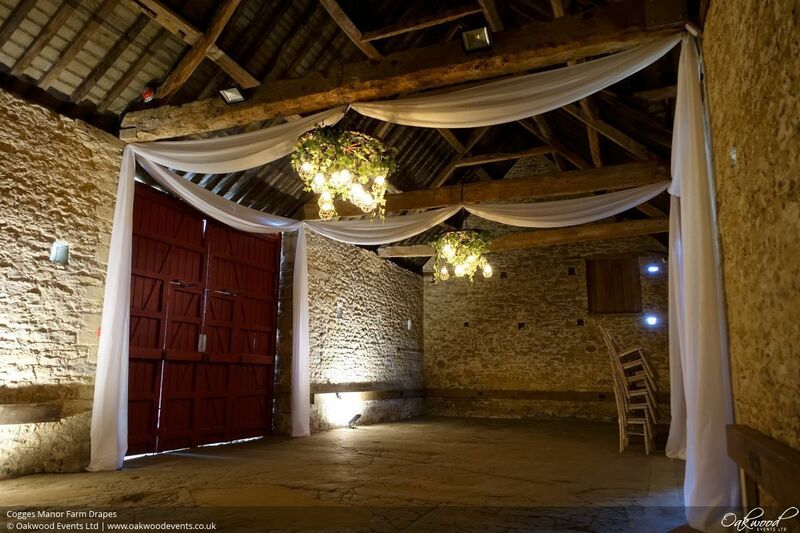 Overhead lighting installations have stringent safety requirements which must be met to ensure the safety of you and your guests. 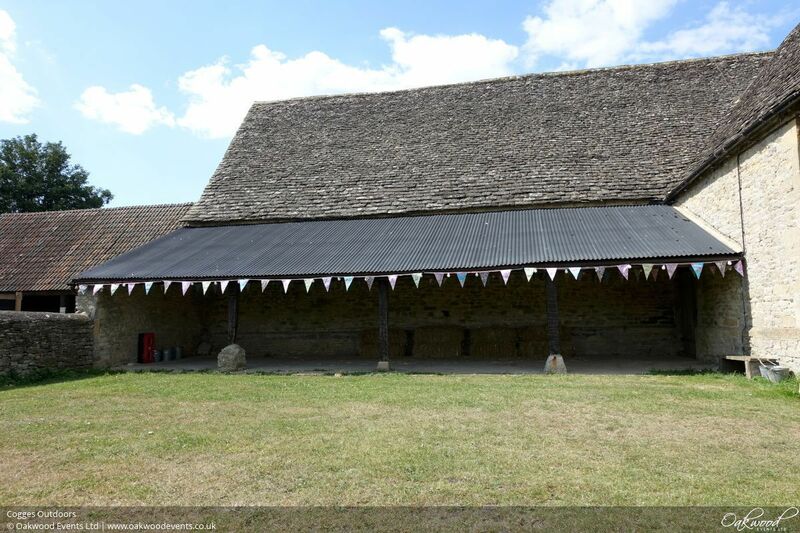 All of our installations are designed with safety in mind, using only high quality professional equipment which is regularly inspected and maintained. We hold relevant public liability insurance (PLI), portable appliance testing (PAT), electrical safety and working at height certification. 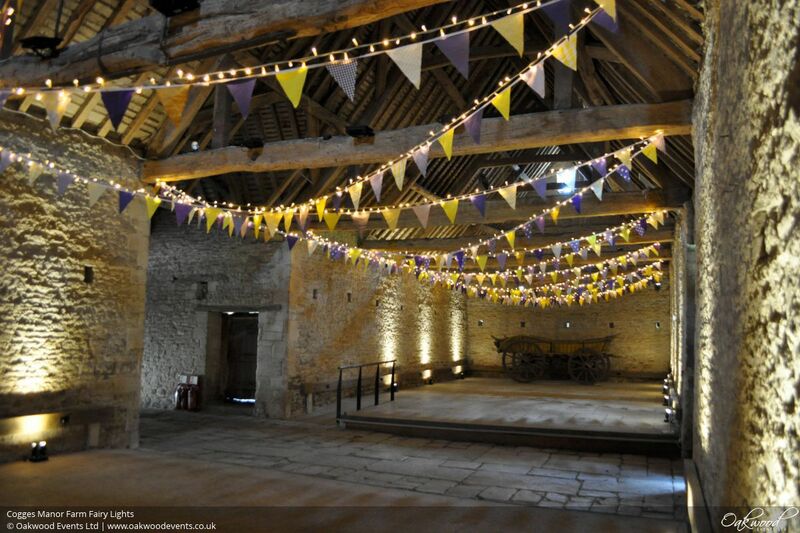 To discuss lighting options and ideas for your event at Cogges, please contact us here.